No matter where you go in the world, there is one consistent thing: satellite access. So while today’s cell phones have plenty of great features and capabilities, consumers lose most of them when the cell tower goes down or they venture too far out of a coverage area. Satellite phones are the solution to many connectivity problems, but they can also give consumers peace of mind when traveling or exploring unknown or remote areas. The best satellite phone offers connectivity and safety with a focus on performance and keeping the airwaves open. 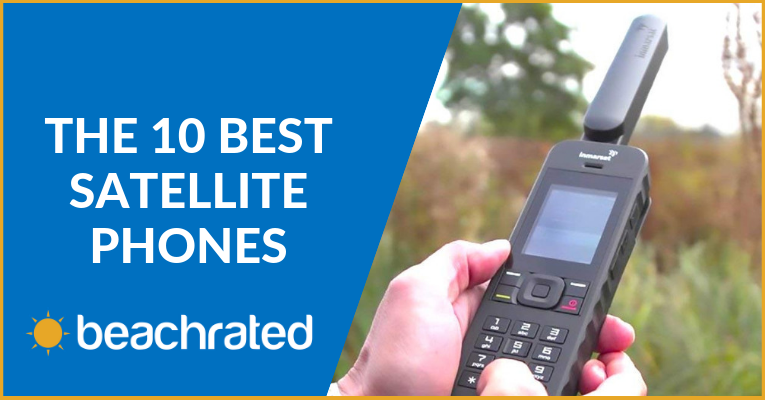 Here are our top picks for satellite phones plus a handy guide on what to look for when buying. Who Needs a Satellite Phone? Worldwide Connectivity: How Do Satellite Phones Work? 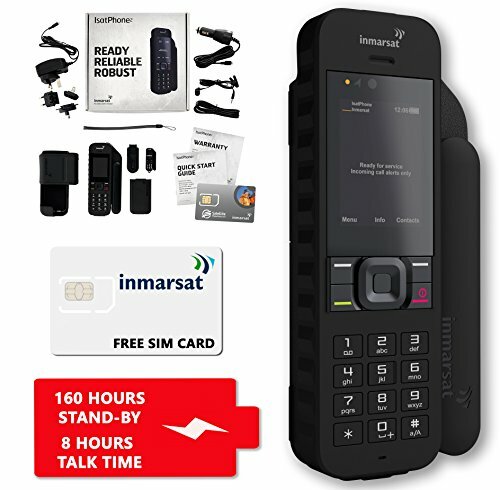 PACKAGE INCLUDES: Inmarsat IsatPhone 2 Satellite Phone, accessories, and a SIM card ready for activation by Seller. Verify IsatPhone airtime pricing and policies with seller. RANGE OF FLEXIBLE AIRTIME OPTIONS: The SIM included with your purchase can be activated with a variety of prepaid and monthly contract airtime options. Verify with seller airtime pricing. 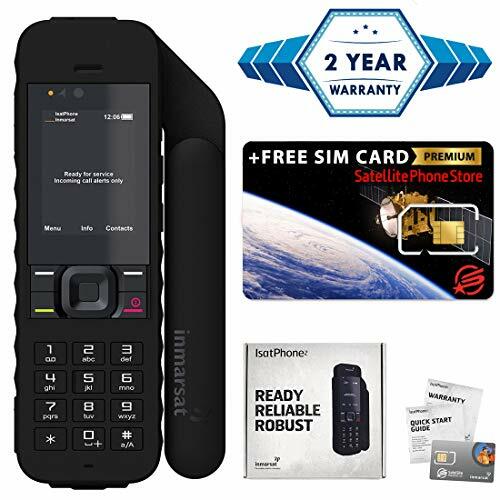 With the option for either a blank prepaid sim or a pre-loaded device with 25 to 5000 units, the Inmarsat IsatPhone Pro2 makes it easy to get a satellite phone in a comprehensive package. Along with whatever unit increment you choose, the bundle also contains the battery, international plug kit, DC charger, holster, hands-free earpiece, a lanyard, USB cable, and a one-year manufacturer warranty. Battery life lasts for days on standby—as much as a week by many reports—a great feature for ensuring you can make calls if an emergency arises. Twitter integration is thoughtful, but the keyboard functions are somewhat limited given the phone’s old-school layout and cumbersome predictive text. The exterior is waterproof, helpful for hikers and boaters alike, and the phone is particularly rugged and resistant to damage. Coverage may vary, however, so it’s wise to check the manufacturer’s coverage map before purchasing. Free messaging is a bonus, however, but requires the sender to use the Inmarsat website for texts. The updated IsatPhone 2.1 promises to offer up to a week of standby usage, resist shock, dust, and water, and tolerate a wide range of humidity levels. In contrast with the 2.0, the IsatPhone 2.1 is more rugged and should provide more peace of mind for those traveling (or living) in extreme conditions. The 2.1 uses the same website text messaging as the 2.0, a fee-free platform that doesn’t require you to pay for received SMS messages. It’s a helpful function to cut costs, particularly if unit costs are high. Like the 2.0, the IsatPhone 2.1 also seems to lack in coverage. While the manufacturer claims near complete coverage save for the poles, there are some areas where service is spotty. However, the coverage area is still expansive, even considering a few dead zones, and satellite service is reliable where many cell phones drop out. It would have been nice to see a trimmer design, as this phone still holds a bit of bulk in comparison with others on the market. 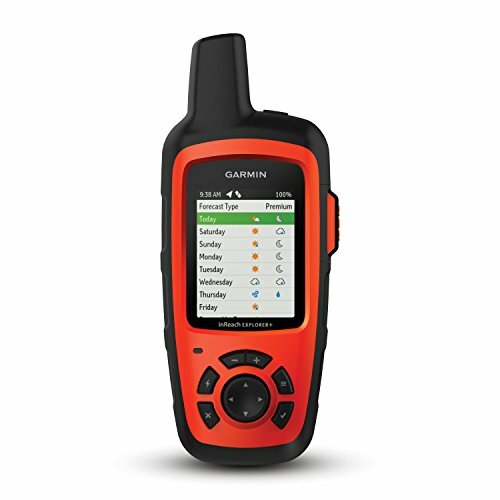 Garmin’s InReach Explorer+ is a pocket-sized handheld GPS unit and satellite communicator that lets you send messages, track your location, and more. It uses the Iridium network of satellites and promises 100 percent global coverage, which means fewer drop-outs and consistent network connection. Pairing with mobile devices via the Earthmate app means you can download maps, charts, and even color aerial imagery to the unit. With these features, you can use the device for more than just communication and emergencies. Navigation features also include breadcrumb trail, routes, and waypoints for tracking progress and reporting stats. And if you do have an emergency, the built-in SOS button connects you with a 24/7 monitoring center for assistance. You can message with personnel at the center and request assistance, plus receive updates when they send aid. With the frequent map updating and continuous connectivity, you can expect to need to charge this unit more frequently than others. However, the upside is there is almost no way you will “drop off” the map. 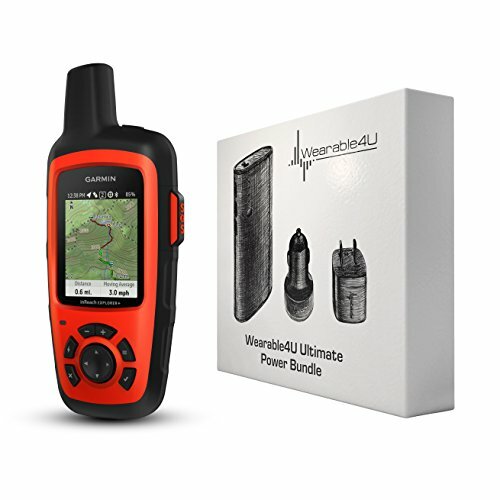 Because the Garmin inReach Explorer+ takes more battery power than alternative units, it’s worth mentioning it again as part of the Wearable4U Ultimate Power Pack Bundle. Along with the unit itself, this bundle features a 10000 mAh power bank plus wall and car USB charging adapters. 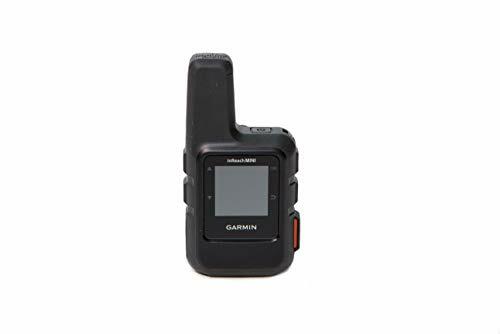 The device uses the same Iridium network as other Garmin devices, and with the added battery power, you can rely on connectivity for longer than ever and in more places. Rather than sourcing the power adapters yourself, you’ll find them conveniently bundled in this package. For the Explorer+ unit, it has the messaging capabilities and SOS trigger key as other models, along with route tracking and sharing among trusted contacts. And with the additional charging capabilities, you’ll be able to use these features for much longer. The Garmin inReach Mini’s size is one of the most attractive things about it: it weighs just over four ounces and will fit in almost any pocket. For peace of mind, it’s small yet mighty; there’s a built-in SOS trigger to connect you with emergency response. At the same time, the inReach Mini also has many of the same features as the full-size unit. Connectivity with the Earthmate app is ideal for syncing the unit with your smartphone, which is helpful since sending messages is somewhat cumbersome. And for messaging, there are both text and email options, though there have been connectivity issues with AT&T devices in the past. However, using email to send messages via the inReach network is still possible even if cellular functions are lacking. Despite its small size, the Mini is rugged, with waterproofing and a rechargeable battery that aims to last for about 50 hours. In the power saving mode, it can even last as long as 20 days on a single charge. A rugged exterior and some handy features give the Iridium 9575 a spot on our list. Not only does the device use military-grade materials, but it also has better functionality than meets the eye. You can tap out text messages or short emails on the illuminated keypad, and with up to 30 hours of standby time, odds are you’ll never run out of power to do what you need to. The streamlined device also has one capability that you might not expect: it functions as a Wi-Fi hotspot. The hotspot is an exceptional feature for those who need their devices while on the go because it enables you to connect smart devices via the Iridium AxcessPoint and get online. The tradeoff is less-than-stellar GPS functions. While interchangeable (and easy to find online) batteries make keeping a full charge simpler, there is the drawback of having a rather flimsy charging adapter. Break that piece, and you’ll be out of luck until you can find and order a replacement (which could be hard to do). 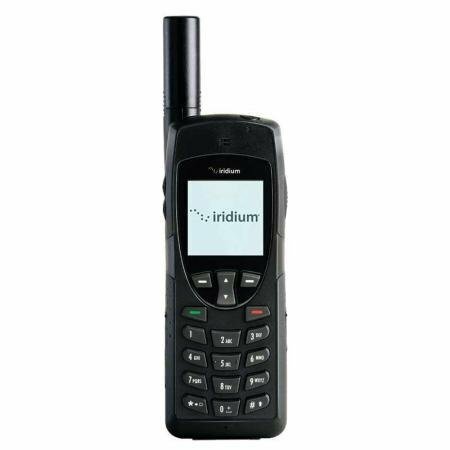 It might look like an early 2000s cell phone, but the Iridium 9555 has more capabilities than the phones of yesteryear. The unit relies on the Iridium network of satellites, meaning it has unparalleled connectivity all over the globe. Prepaid minute plans come in increments from 150 to 5000, but pricing and availability do depend on the region you’re purchasing for. And, depending on where you plan to go with it, you may need to keep an eye on the temperature, as this unit doesn’t have the temperature range that the 9575 does. 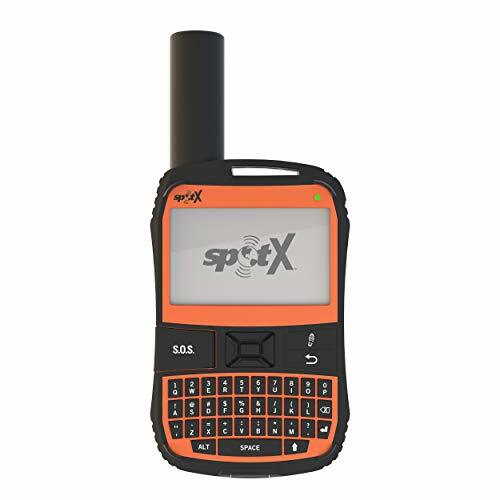 For those who don’t require voice capabilities, the Spot X messenger device is handy for checking in with family or even sending out an S.O.S. in an emergency. You can send messages via SMS or email, plus log in to social media from the unit. And unlike other satellite phones, this one features a full keyboard that’s reminiscent of a Blackberry device. What’s nice about this is it brings messaging back into modern times and makes composing messages a bit easier. However, it’s important to recognize that the Spot is not an instant messaging device. Message delivery times depend on network availability but forecasted success rates are for the device to deliver one message within 20 minutes. Regular updates can be a bit of a headache, but for the ability to send messages from the middle of nowhere (and request emergency assistance as necessary), the Spot X is a handy option. Dual GSM & satellite voice calling through one SIM card*. For international travel, the Thuraya XT-LITE is an introductory level satellite phone option. It uses one SIM card for both GSM and satellite calling to provide coverage throughout 160 countries. The battery offers up to 80 hours of standby time, so the device will be ready whenever you need to make a call. Along with calling functions, this phone also includes an address book, alarms, a calculator, call logs, speed dialing, and more. In this way, it’s a lot like an old-fashioned phone from the 1990s, which will be familiar if not a bit frustrating to some users. Also, the lack of messaging features will be a negative for some users. Of course, if you are focused on emergency phone access on an international trip, the Thuraya XT-LITE has everything you need to stay connected. Additional “phone” features like alarms, etc. Globalstar’s GSP-1600 is a workhorse that can handle operating temperatures ranging from -22 to 140 degrees Fahrenheit and maintains battery life for up to 19 hours of standby time. And although it’s sturdy and weather resistant, the phone offers modern features like data services, including email and internet access. It appears a bit bulky, but the antenna stows behind, making packing easier. When you open the antenna, the phone automatically seeks out the network and connects. The display shows information like battery level, voicemail status, any messages received, and satellite signal quality. You can expect a bit under four hours of voice time on one charge, and there’s also a vehicle-mounted kit available if you use the phone in the car. This way, you can charge it while you’re driving to your destination. Many travelers rely on satellite phones in case of an emergency, while others travel so often that it makes more sense to have an internationally-reliable satellite phone rather than a standard cell phone. These gadgets offer everything from basic SMS messaging to Wi-Fi hotspot service. The best satellite phone is one that fulfills your needs and fits your budget without extra frills. So who really needs a satellite phone? Of course, phone features vary, and you’ll want to choose one based on your specific needs. There may also be a bit of a learning curve when figuring out how to use a satellite phone. And there is a range of plans available depending on what brand you choose and where you’re going. With some phones, it’s as simple as opening the antenna to get the device to connect to the satellite network. Others seek out a network connection as soon as they come online. But most phones aren’t ready to use out of the box. You’ll need to activate the device first, then purchase air time or units to make calls and send messages. Therefore, it’s a good idea to order your satellite phone well in advance of any trip you’re planning. After you receive the device, ensure that it’s operable before relying on it while out in the middle of nowhere! Some devices have Bluetooth or wireless hotspot connectivity, and those devices require specific software to function correctly. If your phone has these features, you’ll want to make sure you have the latest firmware and any other updates before departure so that you can connect to the services you want to access while you’re on the go. With most brands, you can choose either a prepaid satellite phone or a monthly or yearly contract option. However, there are other costs associated with a satellite phone beyond the up-front purchase and the service. Many satellite phones require an activation fee or the purchase of a brand-specific SIM card. Some brands require a separate fee for GPS and mapping services (such as Garmin), while others offer free messaging or emailing via either their app or website. Apart from the initial contract and early termination fees, here are the most common satellite phone plans..
Limited-time units/minutes: You purchase a bundle of units/minutes with a specific timeframe for use. Once the timeframe is up (anywhere from a few days to a year), the minutes/units expire. Monthly contract: Either a set amount of data or an unlimited amount paid for via a month-to-month contract. Yearly service: A per-year fee which covers a specific amount of minutes/units/messages that is good for one year of service. Some annual plans are broken down into a per-month allowance but bill one time per year. Each satellite phone provider can also develop their own plans that vary from these general guidelines. Some providers also charge an early cancellation fee, while many specify that minutes/units do not roll over from month to month, even if your service remains active. Although satellite phones aren’t a necessary purchase for everyone who requires smartphone access, there are a few advantages to satellite phones over other types of communication. Satellite phones rely on satellites in the atmosphere to relay a signal. Most satellite phones allow people to remain connected with family and emergency services no matter where they are in the world. Some have limited service areas, such as in specific countries or away from the poles, but in general, satellites provide better coverage than cell phone networks. Further, many cell phones stop working once you’re a certain distance off land. So if you are embarking on an ocean cruise, your cell phone may stop working not far offshore. Clearly, satellite phones have the advantage here. For many backpackers or even people who live off-grid, cell service is either spotty or entirely unavailable. And while cell towers often can’t reach remote or mountainous areas, satellite phones only require a ‘line of sight’ to the satellite to ensure connectivity. This means someone who lives in a remote area needs only to venture to a high point or a clearing to obtain satellite service. For emergency and survival applications, this is an excellent alternative to attempting to use unreliable cell phone service. Many satellite phones have a built-in SOS function. Whether it’s a voice or text capability, this single-touch button allows you to get in contact with emergency personnel and request assistance. Rather than using a cell phone to try and contact local support, you can click one button and connect to a call center that manages requests. Not all satellite phones have this function, but it’s an advantage that no smartphone has, especially in areas where there’s no or unreliable signal. Of course, there’s always the more rudimentary alternative—an airhorn—but depending on where you are, that may not be as helpful as technology for getting the aid you require. The best satellite phone is one with the features you need at a price point you’re comfortable with. Therefore, what you need to look for depends on what your needs are. Here are a few common considerations when shopping for a satellite phone. If you’re a hiker who enjoys camping in the summertime, waterproofing probably won’t be a top concern for you. However, if you plan to visit the beach or sail on a boat, waterproof functions are going to be vital. A waterproof satellite phone may not be able to withstand a two-hour dive, but it will still work even after being splashed or dropped into the surf. Some phones are even hold ratings for jet-stream water conditions, which is more than sufficient for day-to-day use. In contrast, drier, dustier conditions might require a more durable exterior. Phones with a more expansive keyboard rather than only numeric keys might not be a good option for use in desert or dirt landscapes. For many people, texting has become the go-to method for communication. But for others, voice connectivity is the most important phone feature. Whatever your preference, you’ll be able to find a phone that has the offerings you need with the benefit of satellite connectivity. Some devices are text-only while others have voice capabilities and even internet functions like email and social media connectivity. Many devices are also GPS units, so you can mark trails and track your progress. Decide which features you want before shopping for a satellite phone. Each satellite phone has its own designated coverage area that’s dependent on a few factors. The brand matters, because many satellite phones rely on their own networks of satellites, but coverage can also vary based on where the phone is produced. Some phones don’t work in the continental United States, some advertise limited scope off-shore, and others cover specific countries but not others. Decide where you’ll be using your satellite phone and shop for phones that offer the most inclusive possible coverage for that area. Here are a few factors to consider that will help you choose the best satellite phone. It’s difficult to decide which is the best satellite phone because each consumer has different needs. However, the top feature we want in a satellite phone is reliability. After all, a satellite phone intends to fulfill a specific purpose: keeping people connected from remote locations. Therefore, reliability is the top factor when picking a satellite phone. Frequent firmware updates, dropped calls, and issues with connectivity are all negative signs. These factors mean your phone likely won’t perform properly 100 percent of the time, which means it might not work the one time you need it to. Dependability is vital, and therefore, so is accessible customer service support. The phone you choose should, ideally, come with a manufacturer warranty to protect against defects. But it should also include comprehensive customer support if you have a problem. How much are satellite phones? In general, they don’t usually cost much more than a standard cellular phone. However, many cell phone carriers offer payment plans, which isn’t usually the case with a satellite phone. Therefore, the satellite phone cost is often higher up-front. Of course, most satellite phones are also built to withstand extreme conditions, so it’s possible you can get a lot more use out of these phones than a standard consumer-grade smartphone. Plus, the capabilities that satellite phones offer are unmatched, so a cell phone simply can’t compare. When looking at prices, it’s easy to gravitate toward what is cheapest. However, that doesn’t mean an inexpensive phone is necessarily a good deal. Over time, cheaper phones may break down or become less reliable. Consider your budget when shopping, but also consider the investment over time. 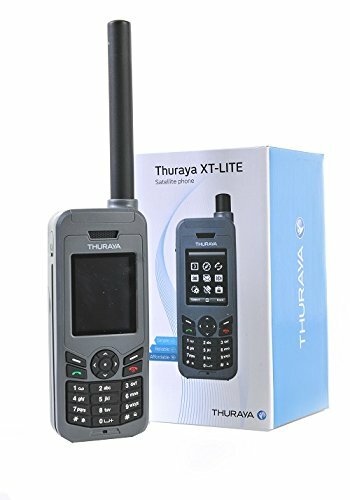 If you purchase a more expensive satellite phone that costs twice the amount of a cheaper model, it’s difficult to justify the cost. However, if the phone lasts three times as long as the cheaper model, then that means you’ve saved more over the long run. At the same time, if you want a specific feature, such as the Wi-Fi hotspot function, there’s no point in looking at more affordable models that only offer voice calling. The idea is to find the best deal for the features you’re after, and sometimes, that can mean a larger up-front investment for a better return on your money over time. Another important consideration when looking for the best satellite phone is the battery life. Exact usage times will vary, but longer battery life is optimal, especially when you consider potential emergency scenarios. Standby time is the most critical measure of battery life, and many devices last up to a week or even longer in standby mode. Most satellite phones offer only a few hours of talk time per charge, but ideally, you won’t need to use it that often, at least in terms of emergency calls. If you plan to have a device “just in case,” then a longer standby time is ideal. If you plan to make calls or send messages frequently (or choose a device with a Wi-Fi hotspot function), the length of talk time might be a more important measure. In general, it’s tough to make comparisons on satellite phones, such as Iridium vs Inmarsat, because each device offers different functions and features. However, there is one phone that we’d consider to be the top pick out of all the best satellite phone options. The Iridium 9575 gets our vote for its Wi-Fi hotspot capabilities, as this is something many other devices lack. Because our society is so focused on connectivity, having Wi-Fi connectivity is the peak of digital offerings. 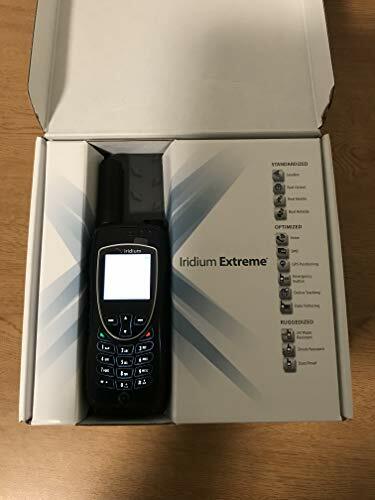 Along with voice, messaging, and hotspot functions, the Iridium 9575 also has military-grade materials and impressive standby time, practically guaranteeing that it will have the battery power to handle whatever communication needs you have. The only tradeoff with the Iridium is its GPS functions aren’t as extensive as, say, Garmin’s devices, but for a near-universal device that will keep you connected, it’s hard to deny the Iridium’s perks. Reliability is key here, which is why the Iridium’s track record is so reassuring. Of course, we wouldn’t mind a cosmetic upgrade, but for now, the Iridium 9575 is the best bet no matter where you need to stay connected.